"The webinar was very good. I can see a lot of well organized techniques for working with my voice students who have public speaking challenges"
"The webinar will help me have a less fatigued speaking voice"
"The webinar was very well organized and presented. I enjoyed listening to the practical examples that you each demonstrated"
Microsoft UK Headquarters invited us to work with their senior trainers on maintaining a healthy speaking voice when they were presenting. The field engineers there have to present to groups of computer users for up to 8 hours a day with a lot of "white noise" in the background from machinery, and needed help to keep their voices safe and flexible. Each of the Core Skills have exercises, explanations and tips for applying to your job situation. And we include some extraordinary visuals covering over 100 years of voice knowledge. 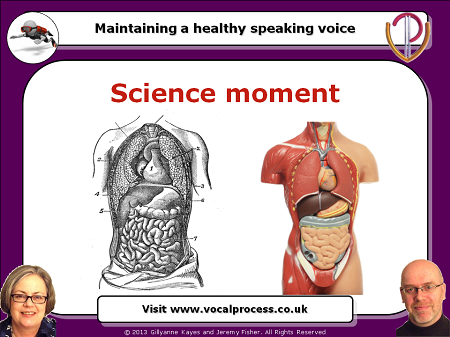 Core Skill 1 - Breath: We start with a science moment for the diaphragm, showing exactly where it is, how it moves and what its primary purpose is. The How-To exercises we demonstrate help you use your diaphragm more actively for speaking. And we include two Watchpoints that you need to avoid. Core Skill 2 - Open Throat: We share why you need to focus on an open throat and exactly how to achieve it. The visuals you'll see on this section of the Webinar include photographs and diagrams of the inside of a larynx, and two images created especially for this Webinar with the true and false vocal folds clearly marked. And we demonstrate a new sequence from Gillyanne on finding the false vocal folds that doesn't appear on our dedicated Constriction and Release DVD. Core Skill 3 - Articulation: We focus on why good articulation doesn't depend on your accent but on the separation of three parts of your vocal tract. You'll discover an awareness exercise for articulation, and several How-To exercises that will improve your articulation. And you'll find one of Gillyanne's most useful diagrams from Singing and the Actor second edition to help you identify all the places of articulation in English. 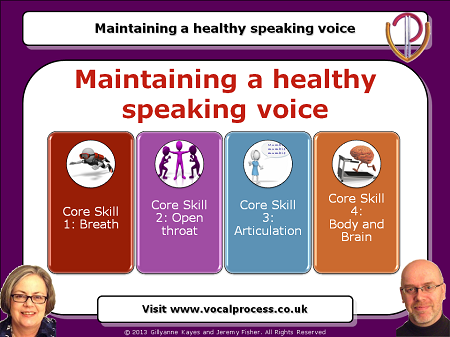 Core Skill 4 - Body and Brain: Find out how posture and body connection help your voice be more effective. And we'll give you four different techniques (Sitting, Head, Standing, Connecting) for connecting your body to your voice, and your brain to your body. "Very well put together and easy to follow. I enjoy the 'science' parts and the practical exercises"
"The webinar will support me in my work as phonetician voice therapist"
"I'm going to try the Core Skills out teaching my college group"
Your purchase price includes full access to the streaming Webinar video. You can pause, rewind and repeat the video as many times as you like for the perfect learning experience. You also get the 35 page Handout containing a detailed copy of the mindmap we created to take you through the information, instructions for the Four Core Skills, and superb diagrams and anatomical images spanning more than 100 years. If you do any of the following - public speaking, telephone sales, preaching, presenting, teaching, or if you use your voice for more than 5 hours a day - you're considered a professional voice user. You need the Four Core Skills to keep you voice in peak condition. Add this Webinar to your cart now!